Introduction EMSL Analytical, Inc. recognizes its Chicago laboratory for CDC ELITE Certification. EMSL Analytical, Inc. is pleased to announce that its Chicago laboratory is now CDC ELITE certified for Legionella analysis. 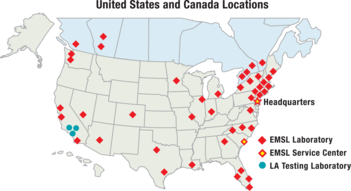 Nationwide, EMSL is the leading Legionella testing laboratory with 16 CDC ELITE proficient locations throughout the United States and Canada. Along with Legionella testing, EMSL Chicago is also accredited for fungal testing in air, bulk and surface samples by AIHA EMLAP. The laboratory also holds AIHA ELLAP, AIHA IHLAP, AIHA ELPAT and AIHA IHPAT certifications. In addition, EMSL Chicago is an A2LA approved food testing laboratory. The laboratory is also NVLAP approved for bulk and airborne asbestos analysis. To request a free copy of our Legionella Pocket Guide that provides key information about the bacteria along with different sampling techniques, please click here. For service questions, please contact Diane Miskowski, MPH, at 1-800-220-3675 extension 2528 or Christopher Goulah, Ph.D., at 1-800-220-3675 extension 1407. For more information about EMSL’s Legionella testing capabilities, please visit www.LegionellaTesting.com. EMSL Chicago is located at 4140 Litt Drive in Hillside, Illinois and can be reached by calling (773) 313-0099. To view a complete list of EMSL’s laboratory locations, accreditations and capabilities, please visit www.EMSL.com. For more information about EMSL’s testing services, please call (877) 435-5227 or email info@EMSL.com.